The PGA and professional golf, in general, is an absolute joke. How many times during The Masters did we hear that Tiger Woods should withdraw himself from the tournament in order to protect the ‘integrity of golf’? First of all, the officials missed the call and it wasn’t until after Woods gave an interview that some caller alerted the Augusta Nationalist (my spelling) Golf Club officials that Woods incriminated himself. Inside a paneled lounge, several white men with southern drawls are drinking scotch and smoking cigars. There is a general laughter that never seems to die down. Suddenly, a perspiring office worker bursts into the lounge. OFFICE WORKER: Gentlemen, someone has just called and said Tiger Woods admitted during an interview to stepping back a yard to take a drop. An Augusta Member (we’ll call him Scooter) drops his smile. SCOOTER: Aw, Bubby, can’t ya see we’re having our scotch and smoking our cigars. 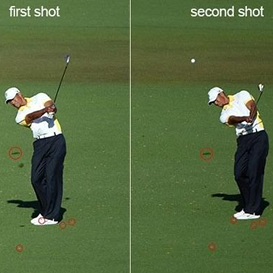 Tiger’s a good ol’ boy and a surprisingly good golfer. OFFICE WORKER: But more people are calling in. And they’re Tweeting, too! Another member (we’ll call him Hootie) puts down his scotch and turns grave. HOOTIE: Tweetin’? Gentlemen, we had better address this issue. Can someone please get a copy of that videotape or film of this interview and set it up in the Hogan Room anti-chamber for our immediate review? Bring your glasses, gentlemen. I have decided that scotch will be allowed for one time only in the Hogan Room. Etc etc etc (I could go on forever with these guys). We all know what happened. 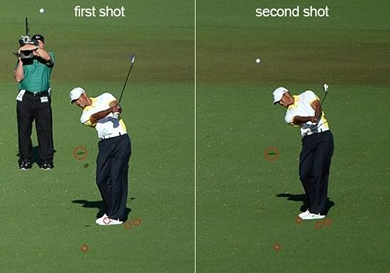 Tiger got a retroactive two stroke penalty and basically was removed from the tournament – at least in spirit. Commentators no longer praised his play or got excited when he made a good shot. Golf Channel analysts called his decision to keep playing a disgrace and an error in judgment that will follow him the rest of his career and taint his legacy. Oh, really? What would have made the situation right? Maybe they should have put him in stocks outside of Butler Cabin for the duration of the tournament and he could have been released by the new champion. Maybe Tiger should have performed hara-kiri like a Japanese samurai on the 18th green because of what he has done to the great game of golf. Has the great game of golf and its legacy of racism and exclusionary policies really taken a hit here? You know what hurts the integrity of golf? 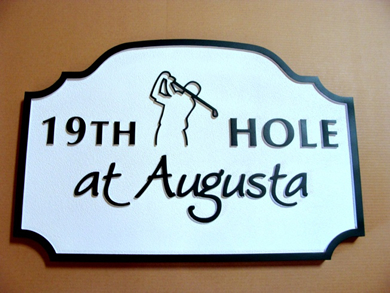 The Augusta National Golf Club and its past policy of excluding women and minorities and doing VERY LITTLE to correct the problem (adding Lynn Swan and Condoleezza Rice doesn’t really get you there). You know what hurts the integrity of golf? The hypocrisy of all those who point a finger at Tiger Woods for cheating on his wife when half the field at The Masters is on wife number 2 or 3 or 4 – with countless girlfriends in between (or during). You know what hurts the integrity of golf? Old white men commenting that the sole black golfer competing in the tournament should quit when you know they wouldn’t ask that of Fred Couples if he committed the same infraction. You know what hurts the integrity of golf? Those crappy looking green jackets that are mythologized to appear as though they were made by the hands of God. 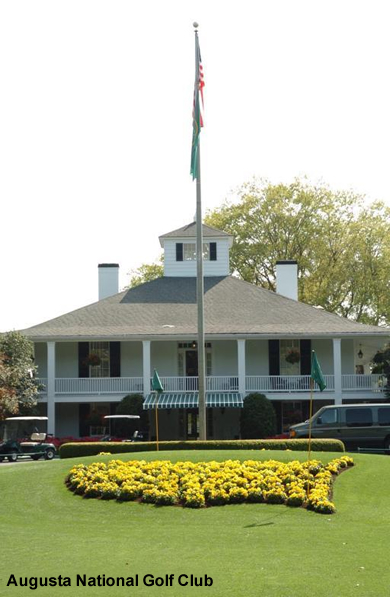 The Masters – ‘a tradition like no other’ – and golf, in general – had better change its ways or it will be going the way of the dinosaur and the Republican party before too long. Great piece, Jill. I couldn’t agree more! Do you even play golf? Some would say that playing chess is a boring waste of time.. I would not because I never played chess and I don’t understand it..But I respect the fact that people all over the world really enoy it and are passionate about it. Therefor it must have some quality to it that is positive..
What if the 14 year old would have broken the rules? Would they have demanded he withdraw for the integrity of the game? That was the most bias and un true article i may have ever read.No facts lots of bias and prejudice toward the club.I’m sure you have never meet any of the people you make fun of-let me guess a mad liberal female.What a surprise your bias opinion is.Why is it ok for the left to be bias and southern white guys fair game. Poor southern white guys. So unfair. They never get a fair shake. Whatever, John. All I can say is this girl has balls! I write that last sentence and cringe, what will people think I ask myself. Yet Jill Kennedy writes like she could care less what people think, I want to be more like her! I’m not a golfer but I do love attitude! Golf is based upon integrity. Most golfers never break 100. Most don’t know when they cheat. Most don’t know the rules. But Tiger knows. A round of golf IS like Hollywood. 18 xxxholes in every studio. And all of them perform under par. Tiger Woods withdrew from a tournament? What a stupid, uninformed article. You must have done your research by reading other stupid, uninformed articles because you clearly know nothing about golf or its rules.